A: Shipping is done thru Canada Post using Expedited parcel to any address in Canada. Shipping is based on ‘cubed weight’ so it is purely dependant on what you order, the product/s weight and size of the packaging will determine the cost. In some cases of a large order the shipping could be less than what is shown on your order, at which time when we pack your order if we can get into a smaller box your shipping will be reduced by us. H.S.T is applied for all shipping within Ontario (13%) Prince Edward Island (14%), Nova Scotia (15%), Newfoundland & Labrador (13%), & New Brunswick (13%). G.S.T is applied for all shipping with British Columbia, Alberta, Saskatchewan, Manitoba, Quebec, Yukon, Northwest Territories & Nunavut. All shipping rates shown on your order include the tax for that province. A: Yes, using Canada Post website. On their Homepage under the Business section there is a TRACK option were you enter your tracking number that will be provided to you so you can see the status of your package. You will recieve from Canada Post a email with a header reading Ship Notification for Item which provides you with your tracking and order numbers. A: We offer car delivery to the Region of Durham or the City or Toronto. Please see maps for boundaries for both areas mentioned on the terms page. Flat rates are offered for those that would prefer there order to be hand delivered. This service is only available Monday - Friday. Saturday & Sunday pick-ups can be done at our OUTLET Store location in the Pickering Markets. Hours for pick-up are 9:00 a.m. - 5:00 p.m.
A: The easiest way is just to click on this Google Map link and type in SIMPLY BRITISH FOODS and it will show where we are. As we are a home based business without the overhead of a store front which allows us to offer the discounts we do to you the customer. A: Yes, all our products are made in Britain to British standards (exception any products containing MEAT). While there are products in the marketplace sold thru various large retailers in Canada that are made in the Britain these are made to Canadian Import standard. I.e. : Cadbury Flake made in Ireland for Cadbury Canada are not the same as Cadbury UK made in Ireland. Every country around the world has it’s own standards when it comes to colours, flavourings & packaging. You change the ingredients you change the taste. French on the packaging will always ‘denote’ Canadian Imported standard. Q: Why are some of you’re products highlited as Vegetarian, Vegan or Gluten FREE? A: All products listed on our site that are ‘suitable for vegetarians or vegans or Gluten FREE are labeled as such on the packaging. For those that maintain these diets for different reasons we want to highlight that we have some products that may suit them. -On-line store hours 24 hours a day 7 days a week on the internet. -WhitbyStore hours are Monday - Friday 10 a.m. - 5:30 p.m. Saturday 10 a.m. - 5 p.m. and Sundays 11 a.m. - 4 p.m. Located at 214 Dundas Street East, Whitby, Ontario. A: For all on-line orders we currently accept Visa, MasterCard, Paypal thru our secured GlobeCharge system. For all home/business deliveries in the Durham Region and City of Toronto we accept Debit, Visa, MasterCard or Cash. As we have secured mobile wireless machines thru Moneris Solutions thus providing these methods of payment. 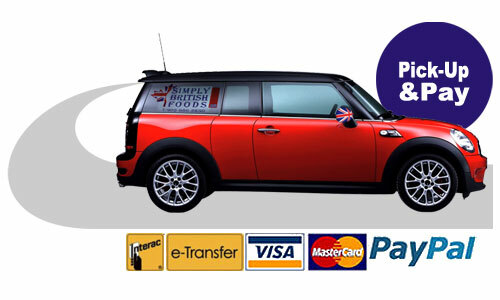 SimplyBritishFoods does not accept personal cheques only certified bank drafts. All orders containing Credit Card sent over the internet is PGP encryted. A: You can simply see the Contact Us page for various ways to contact us. A: If you live in any of the following provinces or territories (Alberta, Saskatchewan, Manitoba, Quebec, British Columbia, Yukon, Northwest Territories or Nunavut) outside of Ontario you only pay G.S.T. (if applicable). As P.S.T is not applied in all other provinces or territories this is a savings of 5 – 8% dependant on where you live. In Ontario, Prince Edward Island, Nova Scotia, New Brunswick, Newfoundland & Labrador you pay both H.S.T of 14%, 13% or 15% dependant on the province in which you reside. A: We are proud that all our shipping materials and packaging can be recycled. From our Paper Shopping Bags, Degradable Bags, Cardboard Shipping Boxes, Tissue Paper and lastly even our BIO-FOAM, LOOSE-FILL packing peanuts are made from corn, wheat, and potato starch – which are renewable and abundant resources and they dissolve in water. 100% Biodegradable. A: We are a retailer ONLY, however if you are looking for a large quantity of a item/s we are more than happy to discuss your needs and provide an attractive discount (relation to our retail) to fill your need. A: We offer a 15% discount when you purchase 2 or more of the same item. We also offer a 20% discount for full carton purchases . You need to contact us in regards to carton quantities and how to obtain your 20% discount as our website will not calculate this discount.